I opened a magnum of this wine for Thanksgiving dinner. It was passed around along side a magnum of 1997 riesling so guests could enjoy both a red wine and a white wine with their meal. The wine paired nicely with the traditional Thanksgiving day dishes. 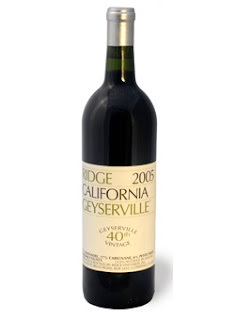 It has a youthful taste and texture, with fresh fruit flavors, rich spices, and plush tannins. It's a blend of 77% Zinfandel, 17% Carignane, and 6% Petite Sirah that drinks nicely now but will probably also cellar quite well for up to a decade. If you are a Zinfandel fan, this is a wine that you should taste. Stylistically, it's right up the middle and has a history of even airing on the refined side. Meaning, it's rich, bold, and actually quite balanced; not a heavy, over-extracted wine. Magnums might be hard to find, but I see the standard bottles frequently at prices around $30-35. I paid $75 for the magnum and consider that a reasonable premium for the scarcer format. Raise a glass!